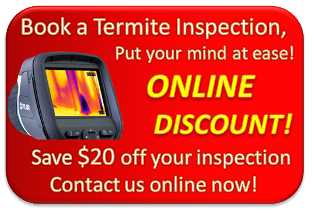 All of our Termite Inspectors are trained in Thermal imaging for Termite Detection. For years we have relied upon Moisture detection to indicate Termite activity behind walls. 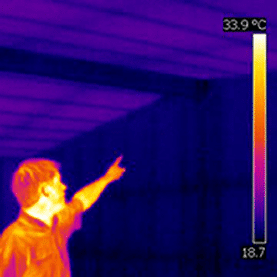 Now, with thermal imaging we can detect slight temperature variances on walls caused by termites and moisture. You’ll be impressed at what our pest inspectors are able to see. 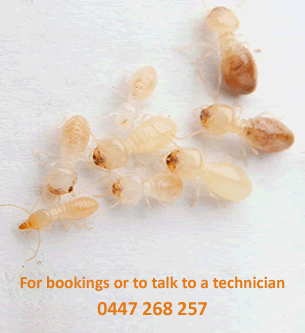 Be sure to ask for Thermal when you book your Termite inspection in Brisbane! Termites burrow under concrete paths and pavers or just below the ground. Unlike ants, Termites spend most of their lives in total concealment making them almost impossible for a home Owner to find. That’s why It’s important to regularly have Termite Inspections at your home by a Licensed Termite Inspector as termites can cause major damage to structural and decorative timbers before you realise they’re there. Beware of the term ‘Free Termite Check‘. This is not a Termite inspection and results can be very misleading. ‘Termite Inspections‘ need to be carried out in accordance with Australian Standards Series 3660. This ensures your Pest controller inspects all reasonably accessible areas of the property as detailed within these guidelines. Termite Guys Brisbane are equipped with the latest Termite detection equipment, our technicians inspect all safely accessible areas of the property within 50 metres of the home. You’ll receive a Termite Inspection report, detailing any concerns and recommendations for your property. Australian Standards recommends that Termite inspections be carried out at least annually and more regularly in high risk situations. I suggest you attend the Termite inspection if possible so the inspector can take you through the process and show you how to protect your home from Termites.